The following DATA step adds ironInf, a grouping variable that is used later during the plotting of the results. In the next step, the data are sorted by the index variable, tpoint. To assess the effect of iron and infection on weight, the natural growth profile of the animals must also be accounted for. Here two alternate models for this problem are considered. The first model assumes that the observed weight of an animal is the sum of a common growth profile, which is modeled by a polynomial spline trend of order 2, the regression effects of iron and infection, and the observation error—modeled as white noise. An interaction term, for interaction between iron and infection, was found to be insignificant and is not included. In the second model, the common growth profile and the regression variables of the first model are replaced by four environment specific growth profiles. Output 27.4.1 shows that the state dimension of this model is 2 (corresponding to the polynomial trend specification of order 2), the number of diffuse elements in the initial condition is 4 (corresponding to the trend and the two regressors iron and infection), and the number of unknown parameters is 2 (corresponding to the variance parameters of trend and irregular). Output 27.4.2 shows that the ID variable is irregularly spaced with replication. The estimated regression coefficients of iron and infection, shown in Output 27.4.3, are significant and negative. This implies that both iron and infection adversely affect the response variable, weight. The variance estimates of the trend component and the irregular component are shown in Output 27.4.4. After examining the model fit, it is useful to study how well the patterns implied by the model follow the data. pattern, defined by the EVAL statement, is a sum of the trend component and the regression effects. 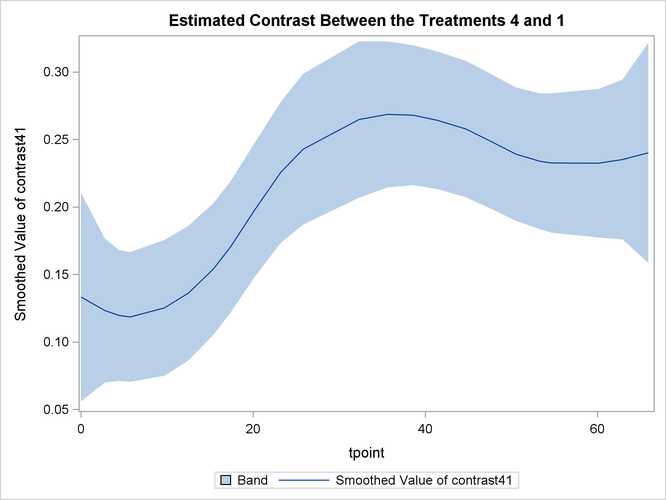 A graphical examination of the smoothed estimate of pattern is done next. The following DATA step merges the output data set specified in the OUTPUT statement, For, with the input data set, Cows. In particular, this adds ironInf (a grouping variable from Cows) to For. The following statements produce the graphs of smoothed_pattern, grouped according to the environment condition (see Output 27.4.5). 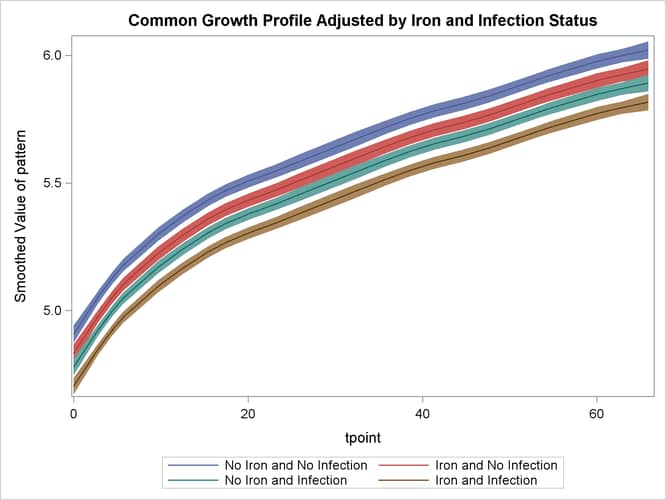 The plot clearly shows that the control group "No Iron and No Infection" has the best growth profile, while the worst growth profile is for the group "Iron and Infection." Output 27.4.6 shows that the model fits the data reasonably well. The following statements fit the second model. In this model separate polynomial trends are fit according to different settings of iron and infection by specifying an appropriate list of (dummy) variables in the CROSS= option of the trend specification. where a1, a2, a3, and a4 are the dummy variables specified in the CROSS= option. This shows that, for any given setting (say, the one for a4) is simply the corresponding trend . In addition, note the form of the COMPONENT statements that define the components a1Curve, a2Curve, a3Curve, and a4Curve. This form of the COMPONENT statement treats the state that is associated with growth, named growth_state_ by convention, as a state of nominal dimension 4—the number of variables in the CROSS= list. This, in turn, implies that a1Curve, which is defined as growth_state_, refers to . These components are subsequently used in the EVAL statements to define contrasts between the trends—for example, contrast21 corresponds to the difference between the trends and . The estimates of these components (a1Curve, a2Curve, . . ., contrast41) are output to the data set For1 named in the OUT= option of the OUTPUT data set. The model summary, shown in Output 27.4.7, reflects the increased state dimension and the increased number of parameters. Output 27.4.8 shows the parameter estimates for this model. Next, the smoothed estimate of trend (growth) is graphically studied. The following DATA step prepares the data for the grouped plots of smoothed_growth by merging For1 with the input data set Cows. As before, the reason is merely to include ironInf (the grouping variable). The following statements produce the graphs of smoothed for the desired settings (since the grouping variable ironInf exactly corresponds to these settings). 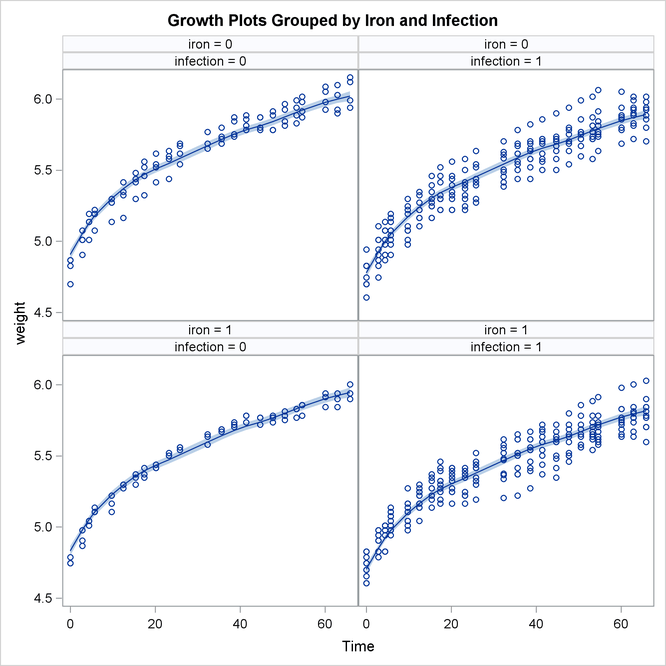 Once again, the plot in Output 27.4.9 clearly shows that the control group "No Iron and No Infection" has the best growth profile, while the worst growth profile is for the group "Iron and Infection." However, unlike the first model, the profile curves are not merely shifted versions of a common profile. The following statements produce the plot of smoothed —contrast between the best and the worst growth profiles. 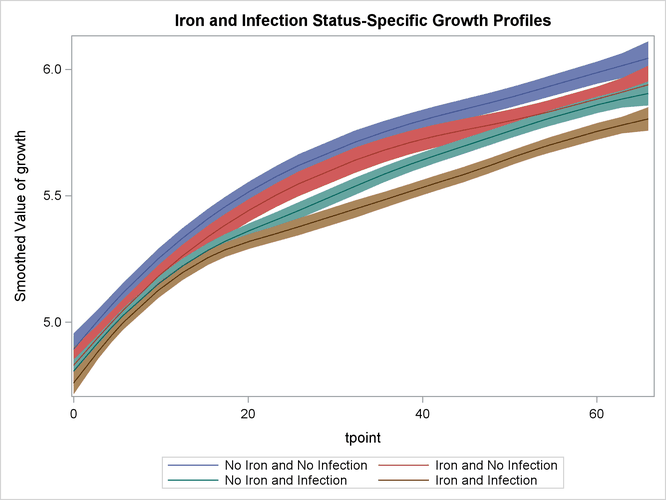 Output 27.4.10 shows that the growth pattern of the control group "No Iron and No Infection" consistently remains above the growth pattern of the treatment group "Iron and Infection."